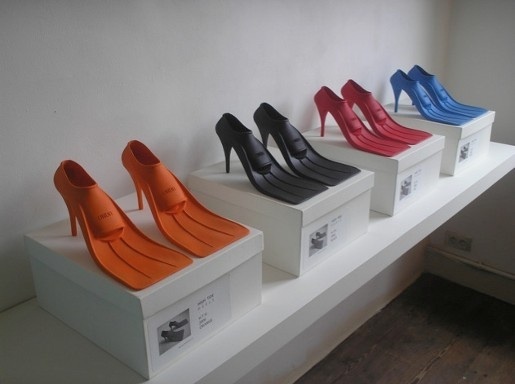 Those rubber kind that you wear when snorkelling, except these particular ones were sporting a 5 inch stiletto heel. 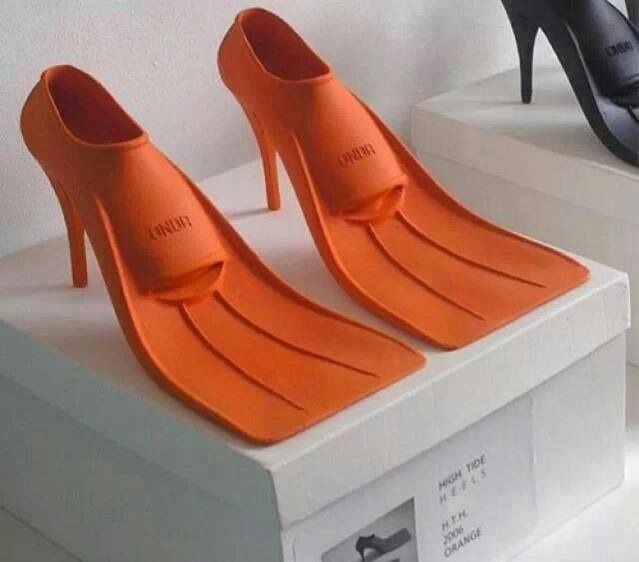 The ULTIMATE flippers! How on earth you were expected to snorkel is beyond me, but I’m guessing that you’d make a rather lovely looking mermaid, and of course i’m sure that the fish would be extremely appreciative of such beauty gracing their depths. The waddle to get to the boat would be amusing to say the least. I think Naomi Campbells’ infamous Vivienne Westwood fall in 1993 would pale into insignificance should she or any other super model don the super flipper of doom. I for one would certainly like to watch someone try…suitable matched with a snug fitting ‘fishtail’ dress of course, for added effect. Sadistic…moi? They have a rather apt name of; High Tide, with no doubt a high price to match…If of course they were actually available to be purchased. Designed by artist/designer Paul Schietekat for an exhibition in 2006 and ideal for the fashionista that wouldn’t be seen dead in a pair of oh so boring (but comfortable and practical) flip flops. In case you are interested I’ve done the research for you, they are available in orange, black, red and a rather luscious aqua blue. Alas no purple. Damn…that’s me scuppered then.